Itron are a world leading supplier of gas, water and heat meters – using flow meters and ultrasonic technology for the utility, commercial and industrial metering markets. Itron have more than 75 key locations with their headquarters in Liberty Lake, WA and have become a trusted partner to the global utility industry, transforming the way utility companies manage their resources and serve their customers – Itron are dedicated to the resourceful use of energy and water. Itron heat meters are designed to measure the thermal energy provided by a source – this can include sources such as heat exchangers, heating systems, district heating, chilled water or general HVAC applications. Heat meters calculate the thermal energy produced using a number of different components, measuring the flow rate of the liquid within the heating system and the temperature difference between the flow and return pipes. Heat meters are comprised of flow meters or sensors to measure the flow rate, a pair of thermocouples or temperature sensors and a heat calculator. 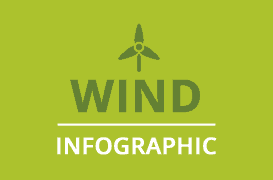 The heat calculator uses the data from the flow rate and temperature differential and calculates the amount of heat generated or used, displaying this for the user typically in kilowatt-hours (kWh). Itron’s heat meters suit a full range of metering requirements, from domestic households and commercial buildings to industrial environments and are RHI MID Class 2 compliant. Itron CF Echo II and CF Echo UltraMaxx utilise ultrasonic technology to measure and meter heat consumption – both conform to MID Class 2 and therefore qualify for billing and MID Class 2 metering applications. Echo heat meters can be mounted in both vertical and horizontal run pipes and are compatible with wide range of pulse and M-Bus* (Meter Bus) communication modules. M-Bus (Meter-Bus) is the European standard EN 13757-2 physical and link layer, EN 13757-3 application layer for the remote reading of gas, electricity and heat meters. M-Bus – Itron meters are compatible with M-Bus networks providing advanced meter reading functionality and reliability. Itron’s CF-Echo II heat meter utilises ultrasonic metering technology to measure with high precision for flow rates as low as qp 0.6m³/h up to qp 15m³/h . The heat meter has a compact design and no moving parts which safeguards it from wear and damage from particles ensuring product longevity and low ownership costs. 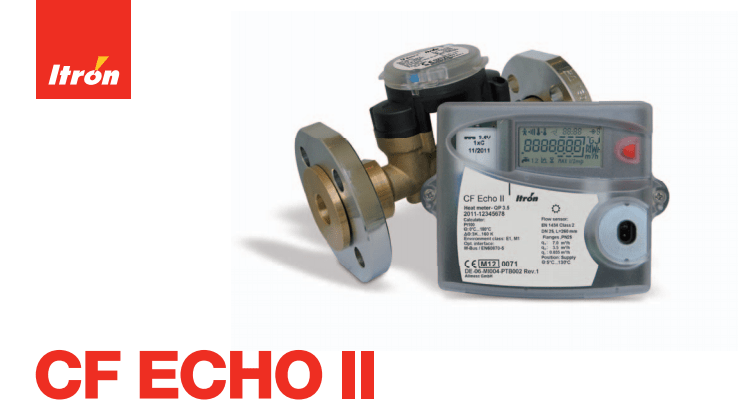 The CF-Echo II is a RHI compliant heat meter exceeding the requirements of EN1434 and MID Class 2 and is also ideal for metered billing of heating, cooling or a combined heating amd cooling systems – a number of advanced functions include data logging for complex network analysis making it a powerful diagnostic tool for network management. The Itron CF Echo II is supplied as a complete energy system with flow meter, temperature sensors and heat calculator and has a full range of communication options including Pulse, Mbus, LON, RS232 and Radio ensuring the heat meter is compatible with Automatic Meter Reading or Building Management Systems. Itron Heat Meter – CF ECHO II Heating & Cooling Meter. Ultrasonic heating and cooling meter, suits pipe sizes DN15 – DN50. The demand for heat metering within domestic, commercial and industrial environments is increasing in response to the need to share heating consumption costs equitably, the development of co-generation in the industrial sector and the growing use of air conditioning in homes and offices. Itron heat meters not only provide accurate billing of heating consumption, but also allow costs to be shared among all consumers in a network, such as residents of an apartment block, or shops in a commercial centre. Automatic meter reading and monitoring systems also make it possible to collect information from heat meters in buildings, houses or sub-stations. 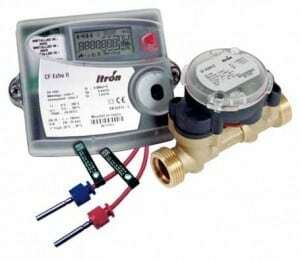 Itron Water Meters. Water is scarce with an estimated 1.8 billion people living with absolute water scarcity. Even where water is plentiful, water distribution and supply systems are aging, demand is rising and managing this precious resource is critical. Itron are helping water utilities make the most of their water by providing solutions that help achieve water efficiency, conservation and management outcomes. 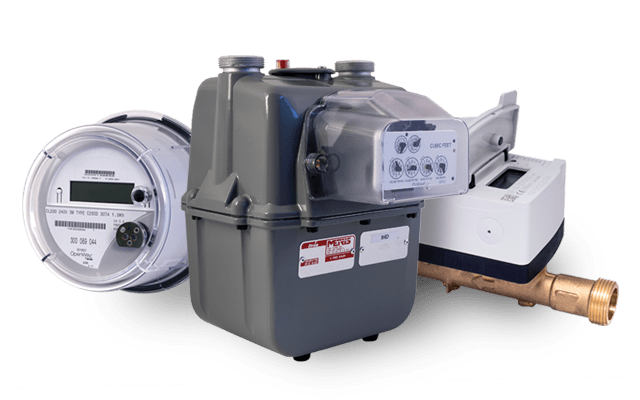 Itron Gas Meters. Gas is a natural resource on the rise and expected to be the second largest primary energy resource by 2035. Watch how Alabama Gas Corporation realised the benefits of Itron automated gas meter reading by moving from a single monthly read, suitable for billing, to hourly interval meter reads. After the installation of 494,000 Itron communication modules, there was a 90% cost reduction per meter read and by gathering reads using a drive-by solution. Module readers could gather data more efficiently and spend time focusing on other value-add tasks like proactive maintenance. Itron were founded in 1977 and believe it is their corporate responsibility to enable energy efficiency and manage and conserve resources for a sustainable future. Itron are dedicated to developing solutions to address the challenges of resource management in a world where infrastructure modernisation, CO2 neutral energy generation and clean water for everyone is essential. Itron strive to provide the most comprehensive solutions for all metering requirements for water, electricity and heat (thermal energy). Itron portfolio includes electricity, gas, water and thermal energy measurement and control technology; communications systems; software; and professional services.